If you’re camping the full English breakfast at the café is a great option! We live in a third floor flat in York centre with no balcony and no garden, something we didn’t think would bother us too much. But as we’ve watched the sun stream through our little windows during this unusually hot Summer we’ve been desperate to get outdoors and find great places to visit where we can enjoy the nice weather. Allerthorpe Lakeland Park is one of these places. 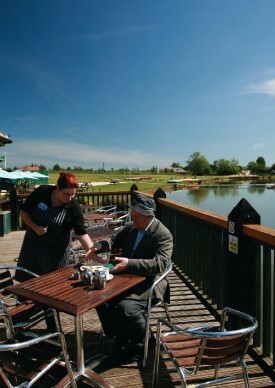 A beautiful lake with water sports, camping, and café just a 30 minute drive from York. We bought a new tent from Go Outdoors and went on our way. The site itself was quiet and spacious with a shower and toilet block nearby. Everything is right there by the lake so you can sit and relax or if you’re feeling more active get involved in some of the activities. The park offers sailing courses, row boats, pedalos, kayaks and windsurfing along with archery and fishing. We had a go on a two person kayak and for £12 an hour it was great value for money and a lot of fun! The park is also pretty child friendly with small horses and birds to see as well as a play area and sand pit. There are also water sport lessons run especially for children. If you’re looking to get out of York for a bit I’d definitely recommend Allerthorpe for a great day out.